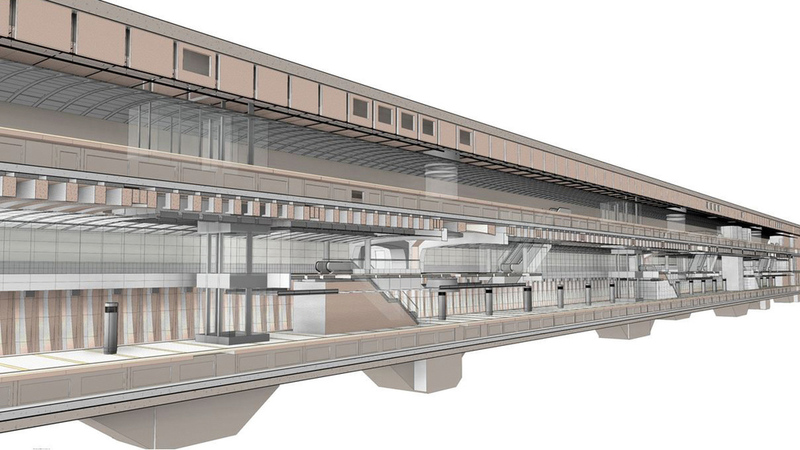 2D drawings and data integrated into BIM. Ceiling of model showing existing conditions (orange) with the new design in white. Location: Manhattan and Queens, N.Y.
East Side Access is a new train station connected to Grand Central Station. It is a public-works mega-project commissioned by the Metropolitan Transportation Authority (MTA) in New York City. When complete, Long Island Rail Road trains will directly connect to the east side subways and Metro North. The project includes the construction of new tunnels under Manhattan, a new eight-block-long concourse and eight train platforms beneath Grand Central Station at a depth of approximately 150 feet, the refurbishment of existing train tunnels under the East River and an above ground train yard and interlocking in Queens. The new terminal is projected to be complete by 2022. The project is distinctive, as it is one of the largest and most complex infrastructure projects currently under construction in the United States. The VDC team client, MTA Capital Construction Division (MTACC), acts as an owner for the project.